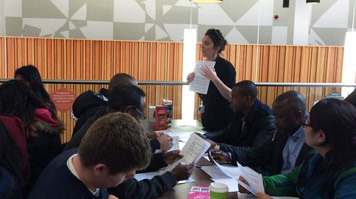 The one-day Hackathon gave students at London South Bank University (LSBU) the chance to solve a real life issue faced by Construction Youth Trust (CYT), while improving their employability skills and gaining work experience. The winning team was awarded work experience placements as Trainee Consultants with the charity. CYT supports young people aged 16 to 30 by providing access to training, education and employment opportunities in the construction industry. The charity is currently working on a Knowledge Transfer Partnership (KTP) with LSBU, which looks at the outcomes of the Trust's work with disadvantaged young people. At the Hackathon, CYT challenged students to explore how digital technology could be used to improve the process of recording and evaluating the charity's impact in helping young people access employment opportunities. Teams then presented their ideas to a panel of judges, which included staff from LSBU's School of Business and the Willmott Dixon Foundation. Judges awarded first prize to a team of students who proposed an app that uses animation to make filling in data more interactive and engaging for young people on CYT's programmes. "There was tough competition from the other groups. We are glad that we won and received an unexpected work placement with the organisation. Overall it was a really good experience taking part in the Hackathon," says Rosaline Ratnasothy, MSc Internet and Data-Based Systems student. The student Hackathon is another positive outcome of LSBU's KTP with CYT, which is supported by the Welsh Government, Innovate UK and Willmott Dixon.